Pharmaceutical firm Johnson & Johnson has warned that one of its insulin pumps for diabetics is at risk of being hacked, causing an overdose. 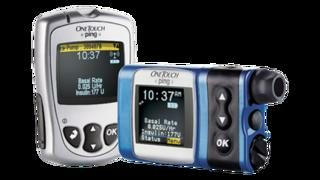 The firm said the vulnerability concerned its OneTouch Ping pump which is only sold in the US and Canada. However, it told the BBC there had been no reported attacks and the risk was "extremely low". "It would require technical expertise, sophisticated equipment and proximity to the pump," it said. The disclosure was made in a letter to patients on 27 September, the firm said. The Animas OneTouch Ping pump, which was launched in 2008, enables diabetics to dose themselves with insulin using a Wi-Fi remote control. This removes the hassle of directly accessing the device, which can be worn under the patient's clothes. Johnson & Johnson said the pump was not connected to the internet or to any external network. But Jay Radcliffe - a diabetic and researcher with cyber security firm Rapid7 - said he had discovered it could still be hacked from a distance of 25 feet. He found communications between the pump and its radio frequency remote could be hijacked - in theory allowing a hacker to administer unauthorised injections. Johnson & Johnson (J&J) said it had confirmed Mr Radcliffe's findings but that the pump remained "safe and reliable". It said worried patients could take precautions, such as not using the pump's remote and programming the device to limit its maximum dose. There are growing concerns over the risk of medical device hacks. In February, cyber security firm Kaspersky Lab revealed it had hacked into a hospital's IT infrastructure - with its permission - and was able to access an MRI device. And the US Food & Drug Administration is said to be preparing formal guidance for manufacturers on how to respond to reports of cyber attacks. The agency has previously urged medical firms to work with cyber security experts to mitigate risks - however it says it knows of no cases where criminals have hacked a device to cause harm.